Pioneers in the industry, we offer losartan potassium & hydrochlorothiazide tablet from India. 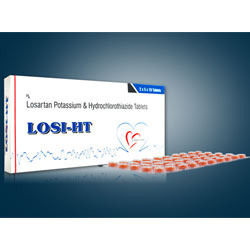 We are engaged in offering a wide variety of effective Losartan Potassium & Hydrochlorothiazide Tablet that is formulated using high-grade ingredients. Formulated under the guidance of adept medical experts, these products are ensured for their compliance with the medical industry standards. Moreover, our tablets are ensured for their safe consumption, perfect formulation, rich effectiveness and ability to provide instant relief. Looking for Potassium Suspension ?